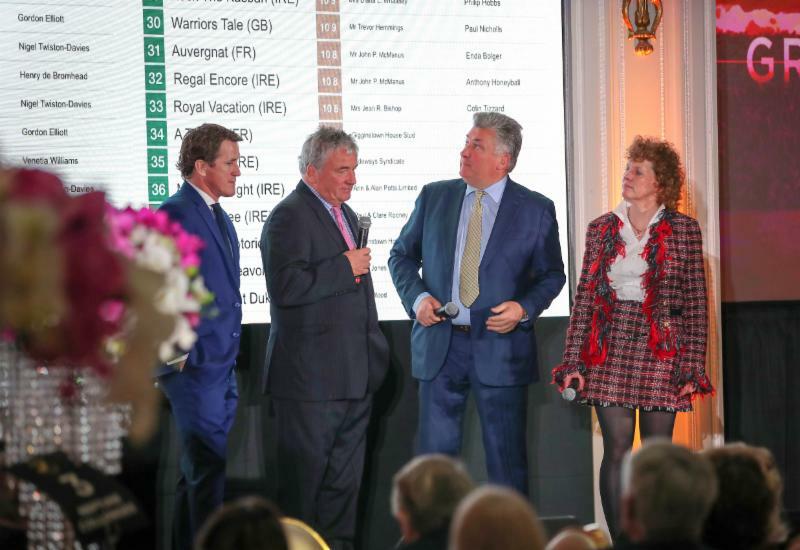 Tuesday, February 12, 2019 - The weights for the 2019 £1-million Randox Health Grand National were revealed at the historic Cunard Building in Liverpool today, Tuesday, February 12. Rose Paterson, Chairman of Aintree Racecourse, got proceedings underway. She said: “I would like to start by thanking all the trainers here – I think a record 21 – for supporting our event. “We did ask ourselves if going ahead at this extremely difficult time for British horseracing was the right thing to do and you gave us your emphatic endorsement. Thank you for that. While our thoughts are with you, your staff, your owners and your horses, it is wonderful news for us all that racing will start again tomorrow. “I would also like to thank Nick Rust at the BHA and all of our friends in the press and media for their advice and encouragement in the past few days. I feel the least we can do in the circumstances is give you a good lunch! 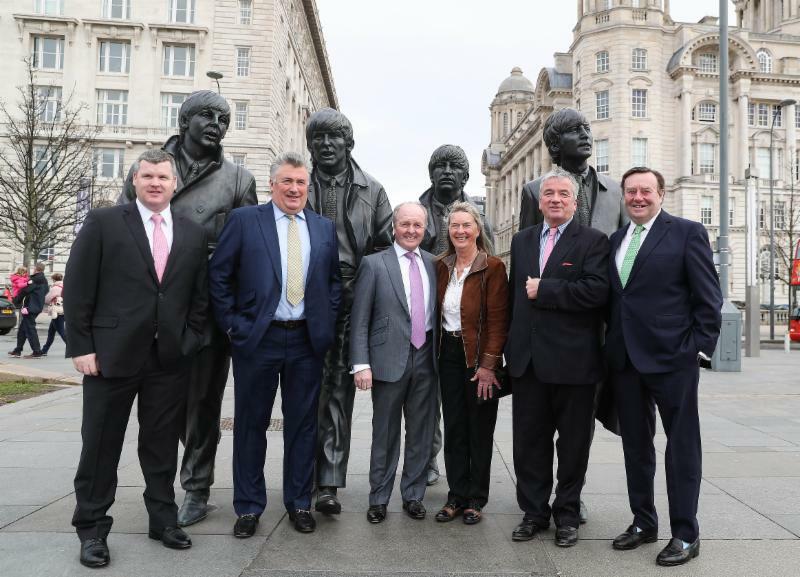 “Welcome to the launch of the 2019 Randox Health Grand National and the great city of Liverpool. A hundred years ago, the National returned to Liverpool after being staged at Gatwick during the First World War – pre drones of course! “The 1919 winner was Poethlyn, which is Welsh for brandy, so I hope that is a cheering thought even though it sounds quite disgusting. “After 42 years in London, we thought it was right to bring the weights event back to its rightful home and I hope you agree. “I would like to thank our immensely generous sponsor, Randox Health, now in their third year after two hugely successful and enjoyable Festivals. We really appreciate your support and look forward to another thrilling three days together in April. “Secondly, I would like to thank our broadcast partners, ITV Racing. 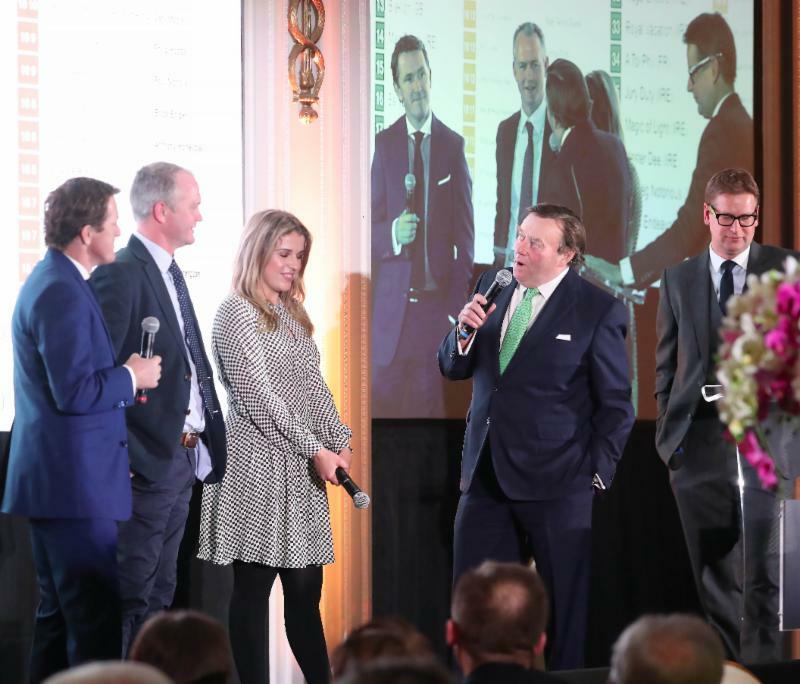 They have done a superb a job for us and our sport over the past two years, culminating in a BAFTA Award for their coverage of the 2017 Randox Health Grand National Festival. “Last year’s programme was epitomised by a spine-chilling opening feature, voiced by the late great Hugh McIlvanney. Hugh was a great friend to Aintree and to racing. He transcended our sport with his words and will be inducted into the Aintree Hall of Fame on Grand National Day to join the distinguished list of Aintree legends – several of whom are in this room. I am delighted that Hugh’s wife Caroline will be joining us. 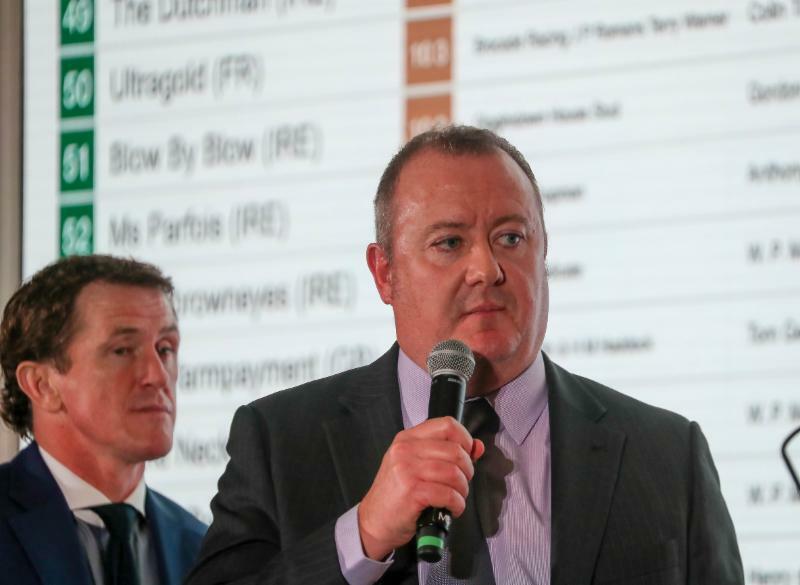 “We have no less than 112 really classy entries in this year’s race, including a record 47 trained in Ireland – not all of them by Gordon Elliott! We know we are in for a terrific contest and we welcome Martin Greenwood as the new BHA Chase handicapping team leader. I look forward to the lively discussion of his handiwork this afternoon. Colonel Mark Campbell, Senior Manager at Randox Health, commented: “Our sponsorship has been fantastic. “600 million people across the world watch this race, so it offers the unique opportunity to link our brand with a truly global sporting event. “We have a fantastic relationship with the team at Aintree and The Jockey Club. 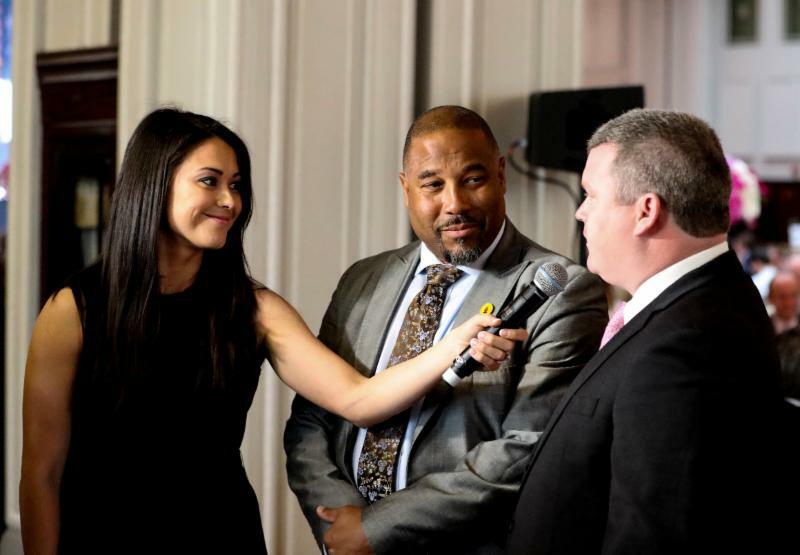 Sam Quek MBE, who formed part of the Gold Medal-winning British hockey team at the 2012 Olympics in London, is an Aintree Ambassador. She explained the importance of the Randox Health Grand National to Liverpool: “For me, the Grand National means so much to the people of Liverpool. “I remember growing up, even at the age when I wasn’t old enough to have a clue what was going on, that the Grand National was all about bringing the family together. “My mum is a Scouse, but my dad is originally from Singapore and across them I have about 17 aunts and uncles so you can imagine how many cousins I have. We all used to squeeze into one front room, pick our horses and watch the National. Greenwood, who has total discretion in deciding the weights for this race only, has grey Bristol De Mai as top-weight with 11st 10lb, but lowered the horses rating to 168 from 173 to do so. He said: “It’s been really interesting doing the weights this year. It has been an honour and a privilege for someone who has loved National Hunt racing all his life to take it on after Phil Smith. “The amount of horses weighted 11st or higher is down on previous years, but on the positive side, we have a lot more horses who are rated 150-plus. “I think it is an excellent renewal and there are plenty of top-class handicappers in there. “Tiger Roll went up 9lb last year for his win in the Grand National last year when idling out in front arguably. He confirmed that rating in the Glenfarclas Cross Country Handicap Chase at Cheltenham in November, with the Cross Country fences having an increasing input into the Grand National. “Pleasant Company ran a stormer in the Grand National last year and, in the two races so far this term, I don’t think he has shown form anywhere near that, but I feel being back at Aintree will suit him. “The hardest horse to rate was Enda Bolger’s Auvergnat. He has run mainly in Cross Country races and won races in that sphere over Josies Orders at Punchestown last year. “I had a big decision to make on his rating as he is rated 158 in Cross Country races, 145 as a regulation chaser and I put him somewhere in the middle at 152. “The Cross Country races are becoming more and more significant with a bigger input to the Grand National. “There are several interesting horses who has been keeping their identities quiet so to speak. Abolitionist won on his debut over hurdles for Dr Richard Newland at Aintree and would need to run in a chase to qualify – he has until March to do that. Jonjo O’Neill, responsible for Minella Rocco (10st 11lb), sent out Don’t Push It to victory in 2010. The Gloucestershire-based trainer said: “The plan with Minella Rocco in the long-term is the Randox Health Grand National. Aintree was the plan for him last year, but the ground just went against him. “He had a hiccup earlier on in the season and that had also prevented us from running him. He returned at Cheltenham the other week and we are also hoping to run him at Ascot on Saturday, but we’re still not sure about the injections (flu), so we’ll have to wait and see if that will happen or not. Warren Greatrex, the Lambourn trainer, reported: “Missed Approach (10st 1lb) is in good form. Regarding his next run, he is in the Eider Chase next week, but I would say the target with him is going to be the Premier Chase at Kelso on March 2. “He ran well in the Becher (sixth on December 8 over the Grand National fences at Aintree) and we have saved him until the weights have come out. “We are happy with the weight he has got and now we’ll get him prepared for Aintree in April. “I was very pleased with his run in the Becher where he finished a creditable sixth. He missed the break that day which didn’t help, but he jumped very nicely throughout. Isle Of Man-based Trevor Hemmings, who has owned three Randox Health Grand National winners and is seeking a record fourth victory from three entries, explained: “I go back many years with the Grand National and it is a very special race for me. “I have been delighted to win the race on three occasions and hopefully we could make it four victories this year. 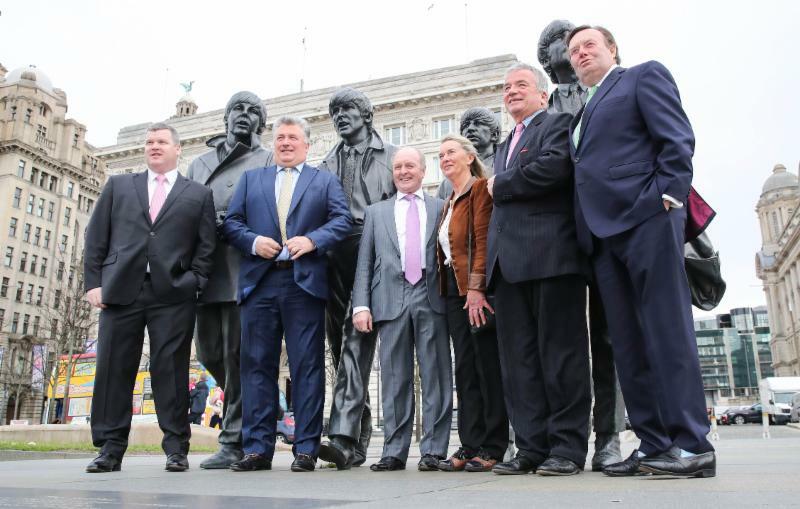 “The Grand National is such a unique race and is the best in the world – no doubt about it. Lake View Lad (10st 11lb) will hopefully be there or thereabouts in the Grand National and he has enjoyed a fine season so far. “Lake View Lad would like cut in the ground, whereas Warriors Tale (10st 9lb) is a horse who would appreciate better ground. Scottish trainer Lucinda Russell, who sent out One For Arthur to win the 2017 Randox Health Grand National, explained: “One For Arthur (10st 10lb) was due to run at Haydock in the Grand National Trial on Saturday, but he can no longer run in that race because he was vaccinated more than six months ago. “We have been really pleased with him and he schooled well over fences in the week and Aintree is definitely the plan. “I think we will now look at Kelso on March 2 with One For Arthur as a possible target going forward. We would like to get another run into him and if he could go to Kelso that would fantastic as we would like to get him back on the racecourse before returning to Aintree. “It would be very special to go back to Aintree and win a second Grand National. “Things haven’t really gone to plan for One For Arthur this season with two unseats to his name which hasn’t been ideal, but I think we have got him right now. “One For Arthur is a year older and looks much stronger now. He seems to be coming back to himself and has matured of late. “There are three or four horses I will probably take out of the Randox Health Grand National. I look on it as a race I have won twice. Obviously, it is the most famous race in the world and it would be good to win it again. “Tiger Roll is a stable favourite and for him to win the Grand National was something else. I thought when he jumped the last and halfway through the run-in that he was home and hosed, but as per usual Willie Mullins, whose horses normally pass mine in the last 50 yards, had one who challenged. Thankfully, Tiger Roll just held on – it was great. Asked to choose which of his entries he would like to ride, Elliott replied: “I would have no choice – it would have to be Tiger Roll (11st 1lb) because I definitely would not be able to do the weight on General Principle (10st)! “It is going to be a struggle for Tiger – his Gold Cup this year is going to be the Cross Country Chase at Cheltenham and if he gets back for the Grand National then great. Whatever happens, happens – he doesn’t owe us anything. Tiger Roll is in very good form. The plan is to run in the Boyne Hurdle this weekend. “I would like to have around 10 runners in the Randox Health Grand National – General Principle is definitely one to consider off 10st. He has won an Irish National, he jumps and stays and this is a race I have had in my mind for a while. He too is in good form and could be a type for Aintree. “I would love to run Shattered Love (10st 10lb) in the Grand National – she has a nice weight. She will go for the Gold Cup and we will see what happens there first. The Storyteller (11st 3lb) is another classy horse and he has been placed in a lot of Grade Ones. The Somerset-based 10-time champion Jump trainer, said: “We have three entries in the Grand National and they are not all likely to run. “Warriors Tale (10st 9lb) would be ground dependent and we could run him in the Topham instead if the ground was soft. “Black Corton has 10st 11lb which is a nice weight and Give Me A Copper (10st 1lb) has always been a horse I felt would be suited by Aintree and the fences. The Ultima (at Cheltenham in March) is next up for him and if all goes to plan there, then we could be tempted to run in the Grand National off 10st 1lb. “It’s great to be at Liverpool and it was lovely to win the race with Neptune Collonges. It would be nice to find a horse who could emulate him and win it again. The Gloucestershire trainer reported: “I will have to speak to the owners and Anthony Bromley before making any plans about Bristol De Mai (11st 10lb). “The Cheltenham Gold Cup (on March 15) is his first target and if everything goes well, then we will make a plan after that. “I am delighted with Bristol De Mai’s weight and it definitely concentrates the mind more on the race than we would have been otherwise. We will talk about it and then make a plan. “Blaklion (10st 12lb), Ballyoptic (10st 11lb) and Go Conquer (10st 13lb) are all other horses who could run in the race, but we will make a decision nearer the time. Joe Tizzard, assistant to his father Colin, declared: “Elegant Escape (11st 4lb) came out of Cheltenham (second in the G2 BetBright Trial Cotswold Chase in January) very well. The first plan with him is the Cheltenham Gold Cup and depending on how he came out of that, the Grand National could be something we think about. “He has earned his right to firstly have a crack at the Gold Cup and then we will make a decision afterwards – it all depends what happens in March. “His run last time was good and stamina has always been his strong suit. He does tick a lot of boxes for a Grand National, but we’re just going to concentrate for now on the Gold Cup then make a decision afterwards. “Ultragold (10st 3lb) has proved fantastic round the Aintree fences, having won the Topham Chase on the last two occasions. He is a horse who is interesting particularly off 10st 3lb. Patrick Mullins, assistant to his father Willie, multiple champion Jump trainer in Ireland, remarked “Pleasant Company (10st 11lb) is set to run in the Randox Health Grand National again this year. “He was only a couple of inches short from winning the race last year. David Mullins gave him a fabulous ride and the horse’s whole season has been planned around going back to Aintree. He seemed to take to the fences very well last year. “The Grand National is a specialist race; he is under the 11st mark which is a big help. He is an 11-year-old now and it is going to be hard to improve him, but you would be hoping he could go back and run well again. “Pleasant Company disappointed over hurdles at Christmas and he is still a maiden over hurdles – they just don’t seem to turn him on. He was poor in the Thyestes, but that was on heavy ground and he is better on good ground – we’re not too disappointed with his form at the moment. “Total Recall (10st 10lb) is a possible for the Grand National. He is the best handicapped of our horses (10 entered), but he didn’t enjoy himself there last year. He made a bad mistake at the third fence and lost his confidence. “He is the opposite of Pleasant Company as you are hoping he will forget that race and hope he would enjoy himself this year. He is not the biggest horse in the world and that is a worry. “Rathvinden’s (10st 10lb) whole season has also been planned around Aintree. He stayed very strongly in the National Hunt Chase and is economical over his fences. “He is not the biggest, but he seems to have a good technique over his fences and is a good jumper. Rathvinden is a second-season novice and that could mean he is unexposed. He is 11 which is older, but he has had plenty of time off in the past and he ticks a lot of boxes. Kate Harrington, assistant to her mother, said: “Sandymount Duke is owned by Ronnie Wood of the Rolling Stones, who also bred him and owned his dam, who was also trained by my mum and won a few Flat races. Sandymount Duke was her last foal and bred at Ronnie’s stud farm in Kildrare, Sandhill Stud. Pipe said: “Ramses De Teillee had a wind op during the summer and has progressed this year, finishing second to Elegant Escape in the Welsh National. He has a lovely weight. Nicky Henderson is the reigning British champion Jump trainer and has won the championship five times in total. The one omission on the very distinguished CV of the Lamborun trainer is the Randox Health Grand National, although he has trained the runner-up twice – 1979 Zongalero, 1987 The Tsarevich. Henderson said: “The problem is we have done well in the Topham, with six or seven winners, but they lose the plot when they have to go round twice! We have been second twice in 40 years. “This year we have Valtor who was very cleverly bought by Mr Munir. He hadn’t won for three years and we got him going with a couple bits of pieces of work and then launched him at Ascot, when James Bowen rode him. He won by 20 lengths that day so Henderson’s first move to try and win the Grand National saw Valtor raised 16 pounds! Tuesday, February 12, 2019 - Multiple G1 winner Bristol De Mai heads the weights on 11st 10lb, with a lowered rating of 168, for the 2019 Randox Health Grand National, details of which are revealed today (please note the embargo of 3pm UK time today). With a prize fund of £1 million, the world’s greatest chase is the most valuable Jump race globally and takes place over four miles, two furlongs and 74 yards and 30 fences at Aintree at 5.15pm on Saturday, April 6, day three of the Randox Health Grand National Festival. This year sees the 172nd running of the great Aintree chase. Tiger Roll is the 20/1 joint-favourite with Betway, official betting partner of the Randox Health Grand National Festival, alongside Welsh Grand National winner seven-year-old Elegant Escape (Colin Tizzard, 11st 4lb) – Earth Summit was the last horse to win the Welsh Grand National and Randox Health Grand National in the same season (1997/98). Tiger Roll’s trainer Gordon Elliott, also successful with Silver Birch in 2007, accounts for 22 of the record 47 Irish-trained entries. Elliott’s team also features Cheltenham Festival winner The Storyteller (11st 3lb) and General Principle (10st), winner of the 2018 Irish Grand National. Elliott’s big Irish rival Willie Mullins, responsible for 2005 Grand National scorer Hedgehunter, has 10 entries in total. Mullins’ contenders are headed by last year’s head runner-up Pleasant Company (10st 11lb), G2 National Hunt Chase winner Rathvinden (10st 10lb) and Up For Review (10st 2lb), who was an eye-catching third in the Thyestes Chase on his latest start. Other entries with proven form over the Grand National fences include this season’s Becher Handicap Chase winner Walk In The Mill (Robert Walford, 10st) and Ultragold (Colin Tizzard, 10st 3lb), who has captured the two most recent renewals of the Randox Health Topham Chase. No mare has won the Randox Health Grand National since Nickel Coin in 1951. The four female contenders this time around are Shattered Love (Gordon Elliott, 10st 10lb), a dual G1-winning novice over fences last season, G2 National Hunt Chase second Ms Parfois (Anthony Honeyball, 10st 2lb), Magic Of Light (Jessica Harrington IRE, 10st 7lb) and Baie Des Iles (Ross O’Sullivan IRE, 9st 12lb). British Horseracing Authority Handicapper Martin Greenwood, who framed the weights for the first time this year and has total discretion for the Randox Health Grand National, said: “It was fairly straightforward to do the weights. I tried to treat it like any other race whilst bearing in mind there has to be some digression when needed. “Bristol De Mai heads the weights and his rating has been compressed by 5lb as I thought it was better to have a horse at the top of the handicap whose rating was slightly out of kilter. If Bristol De Mai does run then I think it was the right call to make. “I found Auvergnat (10st 8lb) of Enda Bolger’s hard to weigh up. He has a lot of Cross Country form and he was the hardest one I had to deal with. He has been running primarily in Cross Country races and they are events which are having an increasing impact on the Grand National, highlighted by Tiger Roll’s success last year. “His form ties in with Josies Orders and Tiger Roll. He would almost have three different ratings, one in the mid-140s for regulation fences, a high 150s for the Cross Country fences and I have put him somewhere in the middle of that (152) to tie in with Josies Orders. “Tiger Roll is up 9lb from his mark for last year’s Grand National and Pleasant Company 7lb. I have them both on the same mark for what they were rated after last year’s Grand National. Tiger Roll confirmed that rating in the Cross Country Handicap at Cheltenham in November. Pleasant Company has been a bit disappointing in a few runs since, but I think the Aintree fences will bring out the best in him, so that is why I left him on that mark. “I think there are several interesting runners like Vintage Clouds and Elegant Escape, who is towards the top of the betting and he is an improving horse and was a good second to Frodon at Cheltenham last time out so you can see why he is one of the more fancied horses. “I think it would be a knee-jerk reaction to make too much of the small amount of horses who are weighted 11st or higher. I wouldn’t want to get too clever about what the reason is. John Baker, Managing Director at Aintree Racecourse, said today: “The countdown to the 172nd running of the world’s greatest and most valuable chase begins in earnest today with the unveiling of the weights for the £1-million Randox Health Grand National. Where will the winner be trained? Grade 3 handicap chase, £1 million total prize fund. Aintree, 5.15pm Saturday, April 6, 2019. 4m 2f 74y over the Grand National fences. For seven-year-olds and upwards who, up to and including March 19 have started in a steeple chase during the current season and been placed first, second, third or fourth in a chase with an official distance description of’ two miles seven and a half furlongs’ or more at any time during the horse’s career, Horses must also be allotted a rating of 125 or more by the BHA Head of Handicapping following a review of the horses entered and after taking account of races run up to and including February 10. Horses who are not qualified for a rating in Great Britain or Ireland at closing may also be entered. Such horses may be eligible for a weight providing the Handicapper is satisfied that the horse’s racecourse performances up to and including February 10 would merit a minimum rating of 125. To qualify, horses must have run at least three times in chases run under the Rules of Racing of the same Recognised Racing Authority up to and including February 10. At the Handicapper’s discretion, such horses may be allocated a rating. The decision of the BHA Head of Handicapping shall be final. Entries closes January 29, entries revealed January 30 (112 entries – 2 not qualified), weights revealed February 12, first scratchings deadline February 26, second scratchings deadline March 19, five-day confirmations April 1, final declarations 10am April 4. Maximum field of 40 plus four reserves.